Dr. Haughton takes the opportunity to speak to you in this video about how to protect yourself when shoveling snow. Click on the picture to view! 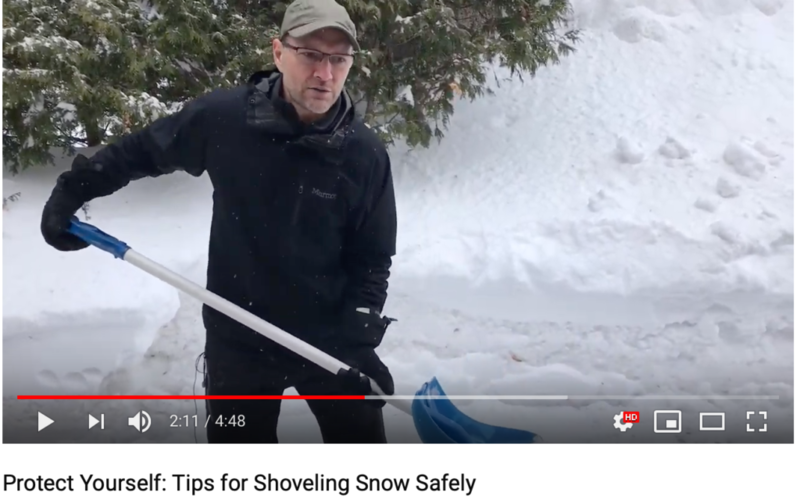 We just had a major snowstorm here in Ottawa so after a day of clearing my driveway, I thought this was a great opportunity to talk about how to properly shovel snow to avoid injury and stay safe! Recognize that shoveling is a vigorous exercise with huge demands on the body. People have suffered heart attacks, had slips and falls, sprains, and back injuries. It is very important to properly warm-up your body and hydrate. Avoid it if you can! Hire a service, use a snowblower, or get someone to do it for you like a friend, neighbour or family member. Older children and teens make great cheap labor! Make sure you have the right shovel. Consider trying an ergonomic shovel to reduce the strain on the lower back. Push the snow to where you need it to go, then throw. Avoid scooping and throwing the snow long distances. Use your knees to lift. Do not bend at the waist. Use your legs to give momentum to your throw. Bending at the waist can lead to back issues. Keep an arch in your lower back. Stick your rear-end out and keep your core tight. Be sure to turn your body towards the direction you are throwing the snow. You never want to scoop and throw while turning at the same time. This is a recipe for disaster. Take note of the weight of the snow. Wet snow weighs a lot more than dry, fluffy snow. The heavier the snow, the smaller the loads you should scoop. And lastly, take lots of breaks! Shoveling isn’t the most pleasurable thing we have to do in the wintertime, but try to have some fun with it, and above all, stay safe!